Annan Athletic entered unchartered territory following their third round William Hill Scottish Cup shock victory over Championship side Livingston at Galabank on Saturday. It was a remarkable cup tie and one Livingston will no doubt want to forget quickly. The visitors started great and for the opening 15 minutes it was one way traffic with Annan constantly being forced to defend deep against the slick moving East Lothian side who attacked the Annan defence at will and when Keegan Jacobs put Livingston ahead in the 12th minute with a superb low shot following a patient build up you feared the worst for Annan. Peter Weatherson stepped to the mark in the 20th minute when he converted a 30 yard free kick and all of a sudden the momentum changed as Annan started to pose the Livingston defence a few problems. You almost sensed that as soon as Annan were awarded the free kick that Livingston were in possible danger when the Annan sharp shooter stepped up to strike a superb low shot round the wall and beyond the diving Darren Jamieson. The goal without doubt gave Annan the lift they badly needed and all of a sudden we had a cup tie on our hands. Watson swung in a dangerous cross following the goal and the Livingston defence defended three consecutive corners as Annan pressed forward. Hopkirk then sent in a dangerous corner in the 27th minute and it took an important save from Jamieson to tip the ball over the bar. It was a good spell from Annan who were using the wind to good effect and Watson was presented with an opportunity from a McColm corner but his header went past. Annan’s pressure eventually paid off in the 41st minute but it was a goal that keeper Darren Jamieson will want to forget when the ball fumbled out of his arms. The lead up to the goal was excellent when Steven Sloan fed Martin McNiff down the left, his low cross was met by Peter Weatherson who’s header squirmed out of the arms of the Livingston keeper and into the net. Livingston finished the half with a flurry and the Annan defence were once again being tested to the limit as Livingston went all out to square the game and it took a brilliant save from Alex Mitchell as he pushed Gary Glenn’s net-bound shot for a corner as the half drew to a close. Livingston started the second half forcing a corner but Keagan Jacobs 18 yard effort sailed over the bar and the opportunity was lost. Annan responded through Hopkirk who finished a penetrating run with an inviting low cross and this was followed by a Hopkirk shot that went over the bar. McColm then tested keeper Jamieson who was happy to conceed another corner. Annan had a let off in the 56th minute when a long kick by the keeper caught the Annan defence square but fortunately the Myles Hippolyte’s effort was chalked offside. Annan increased their lead in the 58th minute, this time Weatherson turned provider when a headed flickon into the path of Stuart McColm who had got a run on Simon Mensing and finished with a glorious low effort into the bottom corner of the net past the outstretched arms of Jamieson. It was a decisive moment in the match and gave Annan a distinct edge at that stage of the game and when Weatherson headed over form a McColm cross the warning signs were there for all to see. As the game entered the final 10 minutes the balance of play swung back in favour of Livingston and the Annan defence were once again subjected to a period of heavy pressure as Livingston forced several corners. The away side were rewarded in the 82nd minute when substitute Danny Mullen poked the ball over the line from four yards. It was just the break Livingston needed and as they threw everything forward they left themselves open at the back and Hopkirk almost made them pay when his excellent strike cannoned off the cross bar deep into injury time. Annan’s victory sees them enter the fourth round and go into the hat for Mondays draw along with all the remaining Championship and SPL sides. ANNAN ATHLETIC: Alex Mitchell, Steven Black, Iain Chisholm, , Martin McNiff, Peter Watson, Steven Sloan , Matty Flynn, Steven Logan, Peter Weatherson ( J Todd 80 min), David Hopkirk, Stuart McColm . Subs not used Craig Murray GK, Scott Davidson, Ryan McStay, Keiran Brannan, Robin Omar, Dan Wood. LIVINGSTON . Darren Jamieson, Craig Sives, Jason Talbot, Simon Mensing (Michael McKennan 63 min), Callum Fordyce, Kyle Jacobs (Danny Mullen 63 min), Burton O’Brein, Myles Hippolyte (David Robertson 72 min), Jordan White, Gary Glen. Substitutes not used Declan Gallagher, Jack Beaumont, Mark Burchell, Paul Grant GK. 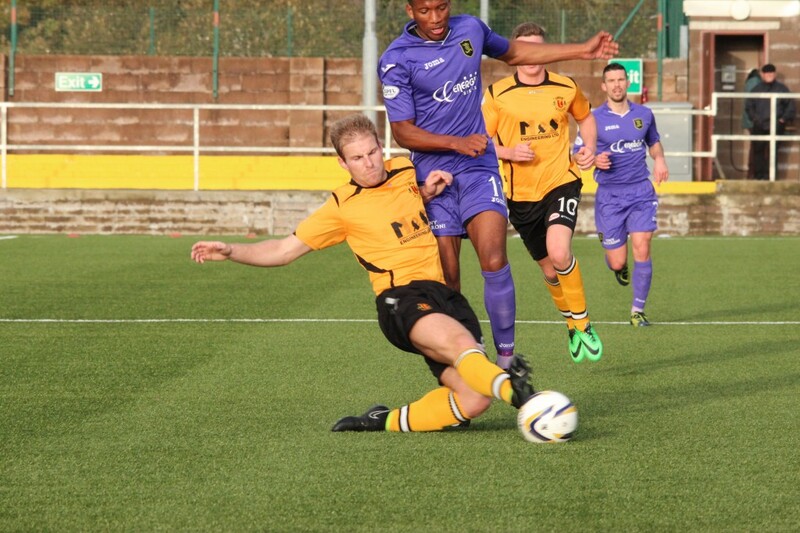 Annan – P Weatherson 20min and 41 min: S McColm 58 min. Livingston – K Jacobs 12min, D Mullen 82min. REFEREE: Euan Anderson, Assistants Mark McClean and Mark Ainslie.